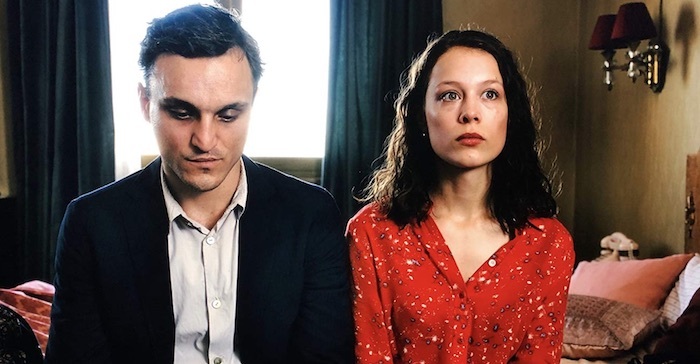 German writer-director, Christian Petzold, whose earlier critically acclaimed works include “Phoenix” and “Barbara,” delivers a much anticipated adaptation of the novel “Transit” by Anna Seghers, which is the last chapter of the trilogy. As a film, “Transit” is only mildly interesting in execution, but full of nuance and important messaging regarding loss of homeland and identity. Issues and themes of the past are woven within a contemporary setting with three main characters portrayed effectively by each actor. The main character, Georg, a German native, escapes Paris during Nazi occupation after assuming the identity of a deceased author. He flees to Marseilles in the South of France, with a wounded friend who ultimately dies en route. His plan is to use the new persona to gain access aboard a ship bound for Mexico. When he arrives in Marseilles, he encounters Marie, a lovely young woman several times for whom he is intrigued by, only to realize that she is the widow of the author. She does not know of her husband’s death or that Georg has taken his identity. In fact, she is in perpetual hope of his eventual arrival and their reunion. Despite her undying love for her husband, and despite the fact that she is actually in a relationship with a doctor who is actively plotting their escape from France, Georg falls in love with her and she with him. In addition to meeting and interacting with both Marie (Paula Beer) and her doctor lover, Richard (Godehard Giese), Georg encounters other refugees, all of whom seem to be a shell of their former selves. They are understandably poor, scared, hungry and desperate. Some of these qualities are communicated through conversations, but most through imagery and an overall sensibility in the film. The film’s pacing is slow, maybe unnecessarily so, yet intense and each of the three main characters are achingly bleak, yet undeniably penetrating to the core, especially Franz Rogowski as Georg. With nominal dialogue, they convey their emotions, or lack there of, through facial expression and longing glances. Although this film is on one hand beautiful, sad and poetic, on the other, it feels maybe too minimal and wanting. Why the historic story is placed in a modern setting is unclear and somewhat distracting, but maybe we don’t need another traditional World War II Nazi infused movie. Maybe the feelings and fears of the actual era transcend time and settings therefore we have no need to see actual Nazis and swastikas. The plight of the German and French refugees in the 1940s in some ways is not so different from refugees of numerous countries in. It is that universal theme that defies time and garners “Transit” much deserved attention and applause.